Imagine that we can observe matter in such a way that we reach fantastic depths in our observation. This is mere imagination, which could be reality if man’s knowledge and technical possibilities were sufficient for its realisation. We already know that matter consists of atoms. Such an image is similar to the starry sky. There are fixed stars, planets, etc. like in a macrocosm. However, we can move further with our imagination. With more thorough observation, nuclear elements would seem to be energy. And, in its life manifestation, this energy would seem to be vibrations. In the entity of the universe, this is the fundamental static thought, which serves as the building material for thinking, thought processes, matter and everything that we perceive as reality. In the dimension of time, it is a force – VIBRATION. It is a proto-podstata thought, it is the entire “Creative Work”, which endures in constancy and timelessness. It is the Creative Work which we humans cognise only in a tiny segment of time, which we call “our destiny”. We humans, just as all other creatures, are just mere observers of certain segments of the Creative Work. They are limited in terms of time and space. It is our destinies, or fixed actions, which we cognise by our perception in the progress of time. We experience and live them. In our cognition and comprehension, this proto-podstata thought is demonstrated as existence divided into various creative areas. We understand matter, then the psychic component and the force component, or the vital component. These components are further divided into a great variety within their own spheres. Matter manifests itself in states. 4) fire, – glow, – a fast oscillation of molecules which transforms all states. I will refer to this rightful division as the “Creative Four”. This is the law of permanent existence, even though for us it is existence progressing in time, initial and final, very changeable in its processes. In the solid state we can recognise the centripetality, which characterises this state. Solidity and rigidity are found here. On the contrary, in the gaseous state, centrifugality, and dispersion can be seen. – In the liquid state, resting, relaxation, trickling and, on the contrary, in fire, disquiet, and the fast oscillation of molecules can be identified. Then we understand the solid and gaseous states as one law with two poles. The liquid state and fire are another law with two anti-poles. Everything that is material is part of this Creative Four, and there is no material that is not under its law. In the psychic realm we can see the analogically same Creative Four as in the area of matter. While the solid state represents centrifugality, the same quality is found in the psyche, where it is manifested as egocentrism, psychic centripetality, or the element of Earth in the psychic conception. Here, the element of air is, as in matter, demonstrated by the centrifugal quality, which represents altruism, unselfishness, turning one’s interest to outwards – towards everybody else. The element of water denotes calm and coolness in the psychic realm – and the element of fire denotes enthusiasm, fanaticism even. 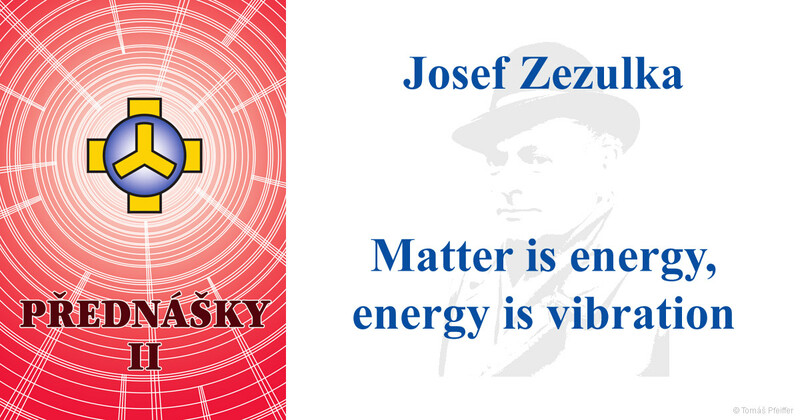 The psychic realm is thus equally the same as the realm of matter. This is the same fundamental idea, simply shown to us in a different area. Organic life, which is a compound of matter and psyche, manifests itself in its life processes through the vital force. This life force passes through inorganic matter with its first current and through basic static psyche (figuratively speaking, through inorganic spirit) with its second current. When matter joins the basic static psyche and thus creates a living being, these two vital currents also join to create complex life processes in organic bodies and psychic processes in the psyche of the being. Vital forces, as well as every part of the Creative Work, must correspond to the regularity of the Creative Four. There are centripetality, centrifugality, excitation and calm, as there are in everything. The three fundamental components of a being’s existence have been described above. Then, there are other areas, which can be perceived by our senses. a) yellow – the element of Earth, centripetality, and ego. b) blue – the element of air, centrifugality, and altruism. c) green – the element of water, calm, and coolness. d) red – the element of fire, glow, enthusiasm, and even fanaticism. In the field of scents, there are heavy, light, calming and exciting scents. In the realm of sounds, there are sounds which, in human speech, are expressed as E–I–U–A.. Regarding tones, there are deep, middle, higher and irritating tones. The first phase is when a primal and very primitive being lives through its passive manifestation. This means it cannot move or make decisions. It only exists and makes an effort to live but is fully passive in its life manifestation. – Its other quality is passive evolution. It does not make any decisions about its evolutionary journey. Its evolution is formed by the perceptions of its surroundings, which affect it and its only experience comes from these perceptions. These are the lives of plants. The second phase begins when a being gains its initial motion and ability to decide. It then already lives an active life manifestation. It decides, and performs acts depending on its quality. Its evolution is still passive. It does not yet strive towards a voluntary evolutionary transformation and its evolution as a being fully depends on the law of reflection of its actions. The being passively accepts the law of reflection, which creates an evolutionary change in itself. Its deeds from one incarnation are transmitted by the impact of the law of reflection into its next life where a change in the being’s quality is made through the experiences from previous existences. This phase belongs to the realm of animals, moving towards man. The third phase commences with man. In his initial incarnations, the influence of the second phase affects a man’s life and he still succumbs to passive evolution. We can say the third phase starts somewhere around the middle of the individual’s human incarnations. Alongside the former active manifestation, an active evolution also starts to take place. A more advanced man starts making more and more active decisions about his evolution. He thinks, contemplates, recognises the life laws and changes voluntarily. This phase commences with man and continues in the time which, to us, is future, when future species, evolutionarily higher, than man will gradually emerge on our planet. After all, the law of evolution cannot end with man. The forth phase lies in the very distant future for us. It will commence when a high consciousness and full comprehension of the substance of life enters the beings’ evolutionary line, when a being stops living on food, as is customary for us, and is able to gain forces of life not through matter but directly through its breath. Then the manifestation of life and evolution will also change into active passivity. Two poles of one law will join in unity. In its evolution, the being will approach the Podstata from which it arose to merge with it at the end of this phase. This is still a long journey over a long period of time. It is approximately as long as the journey which we have taken from the most primitive elementary creature to man. Another area that we can justify is the eras of influence of the Zodiac. As I have understood, four influences affect our planet over long eras. As I was told by astrologists, these eras last for 24,000 years. Within this period, they change every 6,000 years. They affect the human mind and create world cultures which are impacted by their character. In our current time, one of these eras, which has a centripetal character, is drawing to an end and another one with a centrifugal character is beginning. We are at the turning point and, for this reason, we are experiencing a critical period which arises from the transition of these opposing influences. Therefore, there is so much misunderstanding among people. Therefore, there is a battle between egoism and altruism, a battle between capitalism and communal feelings, etc. The centripetal era corresponds to the element of Earth, the centrifugal era corresponds to the element of air. The next era is the era of calm, corresponding to the element of water, and the fourth is the era of fire in which enthusiasm will grow, potentially even into fanaticism. We could continue this way in various areas and we would find the Creative Four everywhere. We could discuss the four seasons, man’s breath with its four phases, etc. We have justified “the concept of the Podstata” and gained a notion about its character through the “Creative Four”. We have said that everything that exists is a fundamental thought which manifests itself in different areas and has such characteristics. This thought is permanent in its core, and colourfully changeable in the course of time. There is an analogy between everything that exists. Everything is connected to everything. As are man’s material, psychic and vital components. Each of these components is a certain formation, static quality and life, processional form. As man passes through many lives, these components keep changing evolutionarily. They are not always in full harmony one with another, or their environment and their era. Man continuously influences them with his views, not always in a positive direction and in a positive way. Man creates disharmony with his mistakes in whatever area and this disharmony may be demonstrated in an illness. A disharmony in one area always simultaneously affects other areas more or less. This also means that in our curative efforts, we can also reach other areas than the one in which the illness arose. If everything is just one fundamental thought, manifested in different areas, imagine each of these areas as the sum of vibrations. Let’s transform the vibrations into a common denominator and imagine man or his momentary thinking expressed as, say, a colour or music. For example, man could be a certain melody. Once he falls ill, the melody is disrupted. However, these are mere ruminations. We do not have the key to such conversions yet. Hopefully, somebody will be able to develop it one day. It is possible, considering the analogy of everything with everything. A human disease is an imperfection somewhere in the three areas mentioned above. If the flaw is found prevailingly in the material area, the most efficient aid is medication, physiotherapy, a scalpel, etc. If the flaw originates prevailingly in the vital area where there are insufficiencies in bodily processes and where the ratios in the vital forces are disrupted, the most substantial aid is to transfer vital forces to the ill person, i.e. aid from sanators and magnetisers’ branch. The most efficient way to treat flaws in the psychic area is psychic intervention. Such interventions include hypnosis and suggestion, but there are also other possible stimulations, which I will discuss later. As there are three fundamental human areas that are mutually interconnected and analogical to one another, the curative aid would ideally combine material, vital and psychic elements at the same time. We already know a lot about the first two kinds of aid. With psychic aid I mean stimulating via the senses (visual, auditory, olfactory) so that the body and vitality are also affected through them. If we contemplate everything that exists as we know it, and if we are aware of the fact that everything is a mere proto-podstata thought, perceived by us, we can conceptualise everything, including man, as a sum of vibrations. If man is angry, his vibrations increase, if he is tired, they languish in their amplitude, if he is in a slump, they slow down. Irritation, flagging, and a slump accompany illnesses and are often the cause of them. Therefore, it is always favourable and valuable for the curative aid to influence the senses of the ill person to help them heal. I suggest several possible ways of doing this, and I believe they will be developed further. One way which seems to be especially promising is the influence of music. For example, if the characteristic of an illness is irritability, i.e. high vibrations in the tissue, vitality, or psyche, it is possible influence this with quiet and calm music in low tones while simultaneously relaxing the body. The body and the vitality are partly calmed via the psychic component. Such an influence may be used on its own or in combination with pharmaceuticals or other kinds of therapy which are supported by its effect. If man is fatigued or the character of his condition seems to be a decrease in vitality, it is necessary to combine calm and energetic music and alternate them for various amounts of time. This creates flexibility, and after a while the man will recover from his tiredness. This refreshment then influences other components. If the illness seems to be a lapse then music with a faster pace or higher tones is appropriate. The curative influence of music is promising both as a separate and complementary factor, and I believe it will soon be developed further and that suitable melodies that serve humankind substantially will be found. Yellow is the colour of centripetality, healing, concentration. Blue is the colour of centrifugality, dissolving activity, exhalation. Green is the colour of calm, coolness, spreading. Red is the colour of excitement, enthusiasm and fire. Suitably combined, colourful melodies, projected in a convenient rhythm and order will definitely become a substantial complementary therapy. Another influence occurs through the olfactory sense. This is nothing new. It has previously been used in religious rites. I am referring to the use of incense during ceremonies or the burning of various aromatic herbs in old religious cults. Besides inhaling the drug, human vibrations were affected by the scent, the aim being to change the tuning of the vibration. Alongside other means, man’s sense of calm or concentration was affected through smell. Why not utilise this option as an additional and strengthening factor when treating patients? This is yet another gate through which it is possible to enter man and support the body’s defence mechanisms against illnesses. To achieve this, the vibrational qualities of various scents must be recognised. The scents need to be categorised into four fundamental groups and their application must be developed. In our present age of haste, nervous exhaustion and stressful situations, the indicated therapies may be used as recreational, separate, or complementary therapies alongside standard treatment procedures. Their great advantage is that they are natural and thus suitable for everyone. I mention them only briefly, giving you an outline. I present them for the sake of reflection and further development which, according to the above-mentioned conception, will certainly not be easy. After all, we have competent musicians who can create psychological melodies according to the above-mentioned key. We have capable psychologists who are able to create elaborate procedures and required applications. And we all want to help humankind. Translated from the Czech original Josef Zezulka - Přednášky II.